Being the leading lawn care and landscaping company in Des Moines, IA requires ongoing dedication to our quality of work and customer service. With outdoor services that include fertilization, weed control, irrigation/sprinklers, weekly mowing and maintenance, and landscape design, we turn your lawn into the best on the block. Lawn, Landscape, & Sprinkler Service We'll create your perfect lawn and outdoor living space. The most critical services for a perfect lawn and landscape include fertilization, weed control, irrigation, and scheduled maintenance (mowing, trimming, pruning, etc). Besides caring for your grass and plants, we can also design and build outdoor living spaces that include custom patios, fire pits, outdoor lighting, and more! One of the most critical aspects of lawn care is fertilization, which delivers nutrients your grass needs for healthy growth and color. Weeds are not only unsightly, but they also suffocate the roots of your grass. We offer both pre and post-emergent weed control. No lawn in Iowa can survive without water. An automated irrigation (or sprinkler) system will deliver the right amount of water consistently. Our schedule lawn and landscape maintenance program properly grooms your property and promotes continued healthy growth. Improve your home with a beautiful landscape or outdoor living space. From professionally designed soft scapes to patios and fire pits. For both beauty and safety at night, we install LED outdoor lighting systems to compliment your home and landscape. Our service area for lawn care and landscaping includes the entire Greater Des Moines, IA area. Listed below are the most popular communities we service Polk County. If you don't see your area listed below and are nearby, give us a call at (515) 289-2020 to see if we can service you, or view all service areas. 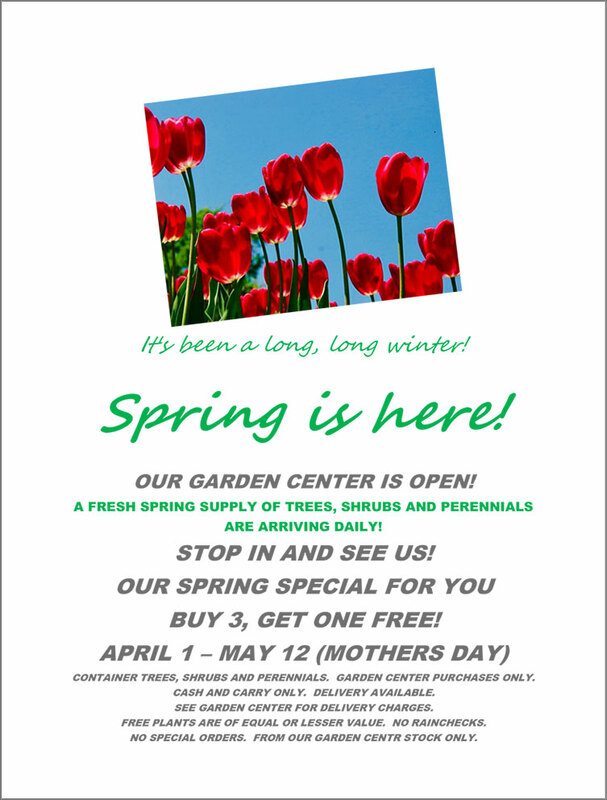 The Garden Center Is Open w/ Special Deals! Our nursery and garden center is now open for the 2019 season. We are running some great deals to kick off spring! From now until May 12th (Mother's Day), we're offering Buy 3, Get 1 Free on container trees, shrubs, and perennials.